Today we finish our discussion of the six virtues laid out by Paul to Timothy. These two today deal with Timothy’s character. Every person in life will have to deal with difficult situations and difficult people – How your character is developed to deal with these makes all the difference in how you lead and how you succeed. Join us today as we look into the meanings and practical applications of how to walk out these two virtues – Endurance and Gentleness. It’s time to fight! We can’t arrive at faith in Jesus Christ and be satisfied – there is MORE, much MORE! 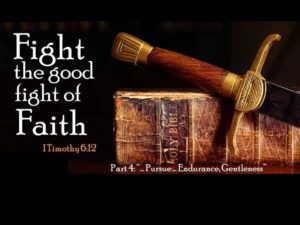 The Apostle Paul, a veteran minister and man of spiritual maturity, challenges his young preacher protege to “Fight the Good Fight of Faith” and he lists in the verses surrounding this passage HOW to do this. In this series, we will investigate the powerful words that surround this challenge from Paul as we are awakened to our goal to “Fight the Good Fight of Faith”.